If you’ve ever wondered what it would be like to live in Rome, or if you live in Rome and wonder what life is like for your fellow expatriates, you’ll enjoy meeting a few of the people who have succesfully settled in the Eternal City. 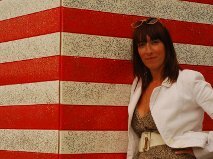 Nicola Ferlei-Brown is a Rome-based British travel writer, passionate about covering stories on where to shop, dine, and find all things divine, in and around the city. She has worked for Wanted In Rome, The Roman Forum Magazine, The Italian Insider, Italy Magazine and Wallpaper City Guides in London. With Italian in her bloodline, she took the road to Rome seven years ago after finishing her BA in Art History and Architecture at Manchester University. Fluent in Italian, she spends her time between Rome and London. She also runs a travel advisory service for tourists wishing to come to Rome. What is the most captivating thing about Rome for you? The sounds, the buzz, a constant beat of dramatic murmur. Above all, the food. Being able to enjoy a glass of top notch wine with the best prosciutto is all in a day’s work, and being able to be at the lakes or on the beach within thirty minutes without batting an eyelid. These are what captivate and tempt me as a London city girl. Has coming to stay in Rome enhanced your work experience? Without a doubt. As a writer and photographer, it’s an inspiring place to be. Rome just sweats a theatrical vibe, she can’t help it, Italians are just so dramatic in the way they express themselves. I love it. Brainstorming ideas, sipping cappuccini, surrounded by Baroque architecture, what a backdrop! It’s a beautiful city, and assists my thinking when I research articles. Being my own boss admittedly grants me time to enjoy my surroundings. It’s a medium-sized city, so I am blessed to be able to benefit from the best of both worlds — work and play. I’ve made contacts and friends that have definitely afforded me a greater work experience. What would you tell a visitor not to miss in Rome? Where to begin? Gallery Borghese is unmissable. Testaccio food market wouldn’t hurt. Lake Nemi for a little dip and some strawberry delicacies, just outside Rome, and the roof terrace at Hotel Raphael [near Piazza Navona] for breath taking panoramic views to help wash down that cocktail. Sculpture-wise, Bernini’s ‘Ecstasy of Saint Teresa’ at Santa Maria delle Vittoria [Via 20 Settembre 17] is mind blowing. If modern architecture floats your boat, don’t miss Richard Meier’s ‘Chiesa di Tor Tre Teste (the “Jubilee” Church, via Prenestina outside the city walls). For Baroque beauties, it may not be by Bernini or Borromini, but I think the mini Church of Santa Maria Maddalena [near the Pantheon] is like a little ruby sparkling in Rome’s jewellery box. Where do you go in Rome to chill out? Villa Borghese is paradise if I want to gather my thoughts. The back streets around via dei Governo Vecchio are beautiful, too, and finding a quiet bar to sit down and people watch, amidst the mad chit -chatter, is quite addictive. Chiostre Bramante’s coffee bar [Piazza della Pace near Piazza Navona] is a blissful afternoon escape if you want to be inconspicuous with wifi and tea. Or the Arciliuto lounge bar [Piazza Montevecchio 5, near Piaza Navona] is another little chill out zone. What is the most memorable thing that has happened to you in Rome? Well, getting hit by a drunk Sicilian taxi driver was a memorable experience. My bicycle was even stolen at the scene of the crime, I mean, you couldn’t make it up. And then I met the man who owns the O in the Hollywood sign in the A and E room as an added bonus. Getting to meet and interview John Grisham under a full moon in the Roman Forum was an awesome experience. Also seeing Valentino’s red gown exhibition at the Ara Pacis is a fond memory. I’ve got one for every day of the week, there are good ones and bad ones that could fill a book. Is there something that annoys you about Rome? Yeah, ha, coffee bar queues and trying to decipher which one applies! That, plus not being able to wear your best shoes to Trastevere unless you are a trained tightrope, tiptoeing specialist. [Because of the bad cobblestones.] Wanting to buzz about on a red Vespa, but not daring to go there. But these are small snippets of irritation worth enduring to live in such a beautiful place.